Gaines, on Brains: Why Does Coffee Make Me Poop? Why does coffee make me poop? Come on, fess up. It happens to the best of us. In fact, I just finished my morning mug, and...anyway, you get the picture. If a cup of joe makes you go, you're not alone – 29% of people have the "desire to defecate" after drinking coffee, according to this 1990 paper published in the journal Gut. In addition to the survey, the study authors studied bowel motility in 14 subjects before and after drinking caffeinated coffee, decaffeinated coffee, or hot water using a manometry probe (fun!). 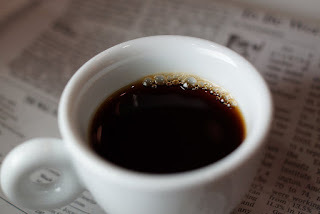 Common sense suggests that, like its stimulating effects on the brain, caffeine must also act on the muscles of the colon, resulting in peristalsis (coordinated contraction/relaxation of the GI tract that cause bowel movements). But the results suggested something else. When asked, 6 subjects who drink coffee and 4 who drank decaf said they felt they could defecate afterward, compared to no subjects who had hot water. Eight of the 14 subjects who had claimed that coffee typically induces the urge to purge showed increased bowel activity within four minutes of drinking coffee. This continued for at least 30 minutes. But interestingly, a similar increase was seen in those who drank decaf, suggesting that a compound in coffee other than caffeine may be responsible. Interestingly, 63% of those who claimed that coffee makes them go were women, which may be supported by research suggesting that women are generally more sensitive to distention than men, and are more likely to suffer from irritable bowel syndrome. Does coffee make you wanna poo? When is the Best Time of Day to Keep a Diary?